The new head tube badge has received quite a bit of attention. A lot of people want to know how it was made, who made it, what the process was. The artist, Karl Edwards, put together a really thorough and thoughtful post, detailing the proceedure. It's a good read, and an interesting story, if you care to check it out. I'm very grateful for all the time and energy Karl put into the design. Here is a link to Karl's version of the process of making the head tube badge. I've been pretty quiet over the past several weeks. It's been a busy time trying to get everything together for this years' North American Handmade Bike Show. The show is scheduled to take place in Sacramento, California from the 2nd through the 4th of March. If you can make it, definitely go. Here are some random photos of projects I've been working on for the show. I'll try and post more pictures soon. Enjoy! This is a project that's been in the works for at least two years now. I worked with the artist Karl Edwards to come up with the final design. We spent months going through hundreds of iterations before finally settling on the design you see here. Then, months more were spent for the actual badge production. I can't relate how pleased I am with the design. The head tube badge you see here is the first prototype. It's very nearly the finished product. It hearkens back to head tube badges in the past. I've always wondered where the artistry went on badges for more modern bikes. It seems like such an important symbol, especially in the world of custom bicycles. 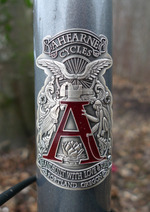 This is my way of marking time -- starting in 2012 all new Ahearne bikes will have this head tube badge.